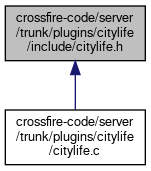 #define PLUGIN_VERSION "City life version 0.2"
Definition at line 47 of file citylife.h. Definition at line 31 of file citylife.h. Definition at line 32 of file citylife.h.